Diamond is formed deep in the mantle, at depths of 140 to 190 kilometers, and is only brought to the surface via kimberlite pipes, lamprophyres, eclogites and other rocks that originate deep within the mantle. The nane 'Diamond' originated from Greek word, 'adamas' which meaning 'invincible'. Diamond is generally considered the birthstone for those born in the month of April. Diamond color is graded on a scale of the alphabet, using letters D (colorless) through Z (slight yellow). Price of a diamond depends on Four C's - Color, Clarity, Cut and Carat (Weight). Diamonds are brought close to the Earth surface through deep volcanic eruptions. It is an allotrope of Carbon. Diamond is an allotrope (different form) of carbon. The carbon atoms in diamonds are arranged in a strong, tetrahedral structure. Diamond is the hardest natural material known and is often used for industrial cutting and polishing tools. Diamond has a hardness of 10 on Mohs scale of mineral hardness, with 1 being the softest (talc) and 10 being the hardest. 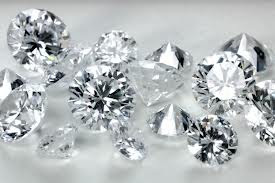 Diamond is the best known thermal conductor (heat transfer) among naturally occurring substances. Most of the Earth’s natural diamond deposits are found in Africa. Around 26,000 kilograms (57,000 lb) of diamonds are mined around the world every year. They are worth billions of dollars to the powerful companies that control their production. Diamond is the world’s most popular and sought after gemstone. They are frequently worn as part of jewelry such as rings and necklaces. As well as their rarity, they are also well suited to jewelry because they polish well and can only be scratched by other diamonds. Diamonds are cut with considerable precision to optimize the luster and attention gathering shine of each specific diamond. Diamonds are valued according to their cut, color, carat and clarity. The Koh-i-Noor diamond was found in India and once thought of as the largest diamond in the world. It is now part of the British Crown Jewels in the Tower of London. The 45.52 carat Hope Diamond appears blue because of boron in its crystal structure and is famous for supposedly being cursed. Discovered in the Kimberley Mine in South Africa, the Tiffany Yellow Diamond weighed an amazing 287.42 carats (57.484 g) when discovered. It was later sold to a New York jeweler named Charles Tiffany who had it cut into a cushion shape of 128.54 carats (25.708 g) with 90 facets to show off its beauty. After being originally found by a slave in an Indian mine, the now 140.64 carat (28.1 g) Regent Diamond has been through an epic history including an English sea merchant and French royalty. It is now on display at the Louvre, where it has been on display since 1887. Naturally occurring diamonds are formed over billions of years under intense pressure and heat. They are often brought to the Earth’s surface by deep volcanic eruptions. The technology for synthetic diamonds was researched in the 1940’s and the first synthetically created diamond was produced in the 1950’s. There are a number of techniques for producing synthetic diamonds, these include high-pressure high-temperature synthesis, chemical vapor deposition and detonation synthesis (literally blowing up carbon with explosives to create extremely small diamond grains). The synthesized material known as cubic zirconia is a crystalline form of zirconium dioxide (ZrO2). It is at times in competition with diamond because as well as being hard, optically flawless and colorless, it is also durable and cheap. They are thought to have been first recognized and mined in India. Diamonds can be identified by their high thermal conductivity. Diamonds, like quartz, can cut glass. About 49% of diamonds of the world originate from Central and Southern Africa. Diamond industry has two distinct categories - one dealing with gem-grade diamonds while the other deals with industrial-grade diamonds. De Beers controls a significant proportion of the trade in diamonds in the world.